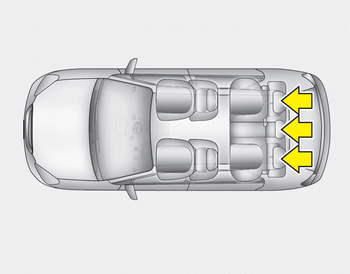 The rear seat is equipped with headrests in all the seating positions for the occupant's safety and comfort. 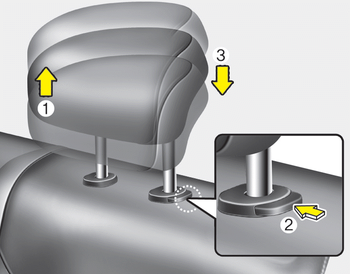 The headrest not only provides comfort for passengers, but also helps protect the head and neck in the event of a collision. 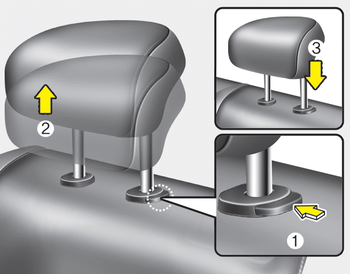 For maximum effectiveness in case of an accident, the headrest should be adjusted so the middle of the headrest is at the same height of the center of gravity of an occupant's head. Generally, the center of gravity of most people's head is similar with the height of the top of their eyes. Also adjust the headrest as close to your head as possible. For this reason, the use of a cushion that holds the body away from the seatback is not recommended.